Chalk is a very soft limestone rock. Surprisingly, the chalk, which the students write on the Board, virtually unchanged from the time of cave paintings. Of course, the production process is modern chalk was complicated with the aim to achieve the best quality, but its function remains the same. The main component of chalk is calcium carbonate (CaCO3) is one of the forms of limestone. Limestone deposits are formed from coccoliths - the tiny flagellate armour plates created from the decomposed skeletons of plankton. For the manufacture of pastel crayons based on calcium sulfate (CaSO4), which is extracted from gypsum - evaporite mineral which forms from the salts of ocean water. Chalk and dehydrated gypsum have similar properties. Pastel crayons also contain clay and oil-binding components and gives vitality to the color. Thanks to this composition, crayons velvety texture that smoothly glides on the surface and does not crumble. Although the production special attention is paid to the purification from impurities, still some of them remains. Main of them are: silicon, aluminum, iron, phosphorus, and sulfur. In smaller quantities are manganese, copper, titanium, sodium oxide, potassium oxide, fluorine, arsenic and strontium. For chalk production limestone quarry is developed; usually it is open development. Then the limestone crumbled and milled together with water in a ball crusher (rotating steel drum, inside of which is sprayed water). At this stage of limestone washed out impurities, and stays clean powder. Mining of gypsum is exactly the same as limestone. The difference is that gypsum should dehydrate to calcium sulfate. This happens in a special chamber, where the gypsum is heated to a temperature of 116-121 degrees Celsius. When boiling is evaporated from 12 to 15 percent of its mass. Further, the gypsum is heated to 204 degrees and goes out of the camera. Then the mass is placed in a vibrating screen, where large particles are eliminated. After that, the powder is washed again, dried, Packed in sacks and sent to the manufacturer of the chalk. In a factory for the manufacture of crayons, chalk or calcium sulfate are ground again. For the production of school chalk in the ground add water and bring it to the consistency of clay. Then the mass is punched and cut into sticks about 60 cm long, which are placed in a special form, of five pieces each. This form is sent to the furnace, where stand a lot during the four days at a temperature of 85 degrees Celsius. 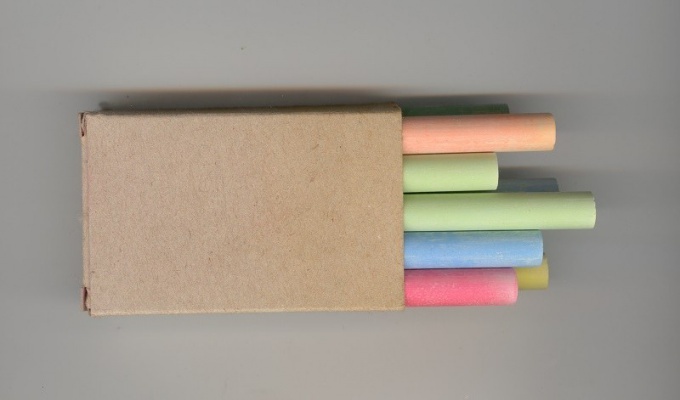 Hardened crayons then cut into bars with a length of 80 mm. For the manufacture of crayons, the pigments are mixed with the base in a dry form, and only then water is added and starts the above-described production cycle.